Wedding planning is off and running and what I’ve realized is that there really are so many little details to consider. Some of these details aren’t very exciting for me (figuring out how to hook up all the lighting in the backyard), but others I probably spend too much time obsessing over. I was incredibly excited to ask my bridesmaids to be bridesmaids, especially because I got to craft a cute little gift for each of them. Simple but sweet, the goodie bags included a homemade soy candle, nail polish, and a mini bottle of rose (scent infuser for my little sisters). Before I get into how to make a candle, I have two pieces of wisdom. Candles have a memory. A lady at the farmer’s market told me this once and it was one of the most useful things I’ve ever learned. When you first burn in a candle, you must let it burn all the way to the edges before blowing it out. Otherwise, it will remember it’s last path and burn down right where it left off. Plan to burn your candles for about 2 hours the first time around. Anyone can make a candle. It’s really fun and rewarding once you get the hang of it. Hot glue the bottom of each candle wick and press down in the center of the jar. Let sit for 5 minutes. Use two clothes pins to clip on to the middle of the candle wick and let them rest on the edges of the jar. The idea here is to keep the wick in place, as it will wilt when the hot wax is poured in. Try to get it as taut as you can so you end up with a straight wick. Melt the wax in the pouring pot for about 30 minutes. If you use a 10 lb bag, you’ll need a little less than half the bag. Stir in lavender scent and remove from heat immediately so the scent doesn’t evaporate. Carefully pour wax into each candle, filling it to the bottom of the opening. Place rosemary sprigs inside each candle, keeping them away from the wick. Let cool overnight at room temperature. Try to keep them on the warmer side, otherwise the wax can cave in on itself while drying. Trim wicks to about 1/4 inch. That’s it! The best part is you can switch up scents, try adding color, or use different types of votives for a whole new candle! We bought a pool table and a dart board awhile back, but didn’t had anywhere to keep track of scores (and how many times I’ve beat Matt in pool). 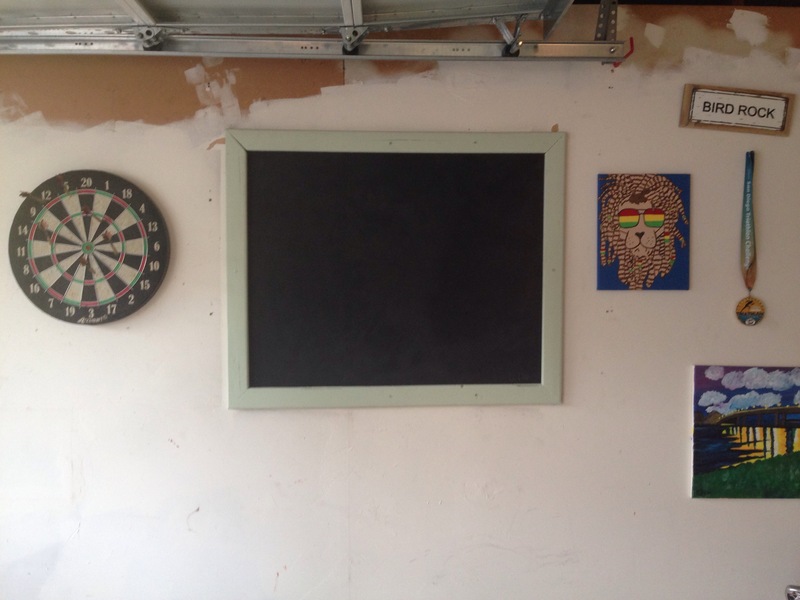 Matt suggested creating a large chalkboard right on the garage wall. Sold! 1. Make your frame or find a wooden frame you wish to use. To make the frame, use a 90 degree angle to outline the edges of your frame so they’ll connect. 2. Create your chalkboard space. Hold the frame up to the wall and trace inside of it. Place masking tape just outside of the lines on all four sides. 3. Sand the wall. This will help the chalkboard paint stick better. 4. Spray your square. 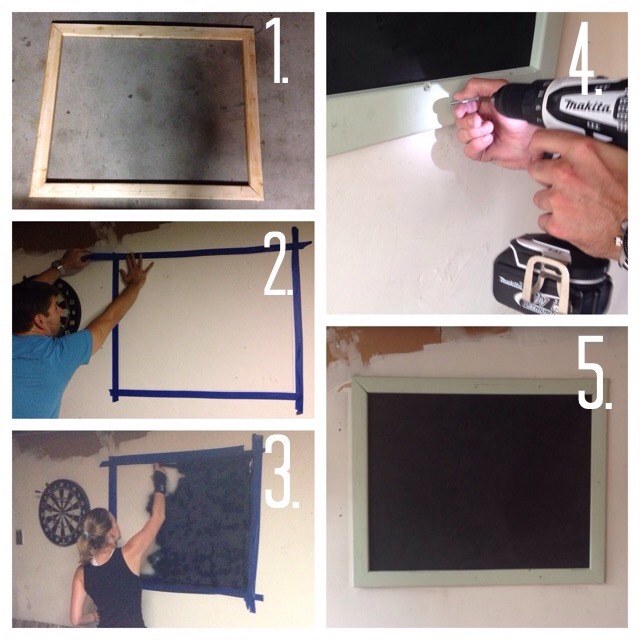 We used chalk paint spray paint but you can always use regular chalkboard paint. 6. Add the frame. We chose to screw it directly into the wall. 7. Voila! Start using it! We found out the hard way that liquid chalk doesn’t work very well on chalk paint, so I recommend using regular chalk.